Get your clothes organized with our pack of 50 ultra-thin lightweight velvet hangers! Unlike other large space-consuming plastic hangers, these elegant velvet hangers beautifully add class to your wardrobe, making it oddly pleasing to the eyes. The Ultra-thin construction with bar allows you to ties at once on one hanger, keep your closet organized. Apart from the look, the durable sturdy structure makes them strong enough to hold 10 pounds. Moreover, the extra sturdy construction reinforces durability making them last for longer time. The no-shed velvety coating will keep up to your expectations and will not come off on clothes or closet. The strong metal hanging hook is given a polished chrome finish to complement almost any closet decor. 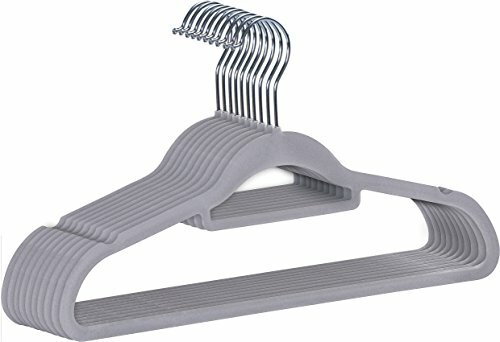 With a complete pack of 50 you will never run short of hangers, giving your closet a consistent unique look. Last but not the least, this set works great as a unique present idea that anyone would welcome and cherish for long. The hooks of these ultra-thin velvet hangers are sturdily designed with 360 degree rotate feature to provide great ease of use. It allows you to easily rotate the hook as required in order to manage your wardrobe in a proficient manner. Do not hang wet clothes! If you have any questions about this product by Utopia Home, contact us by completing and submitting the form below. If you are looking for a specif part number, please include it with your message.